Yellowknife, despite being a capital city, is a small town, so you can drive to most places in about 10 minutes. One of the benefits of living here is that traffic isn’t a concern. It’s not completely devoid of traffic, as there is some build-up at major intersections at lunch time, since a lot of people leave work around the same time to go home for lunch, and from about 5 to to 5:20pm, for the evening “rush-hour”. Compare that with Toronto, where the time to travel the same distance could vary widely. There I used drive to work in about 30 minutes, but the same trip on the return could take 45 minutes to an hour, or 2 ½ or even 3 hours if there was an accident on the highway, or, God forbid, if it was snowing. Now, while I have to factor in time to warm up the engine in winter, I no longer have to think about being delayed due to traffic, and driving time would be even shorter if only the speed limits were higher. In town it’s generally 45km/hr. But in school zones, it’s a sleep-inducing 30km/hr, enforced 7 days a week, 24 hours a day, even while schools aren’t in session, and there are lots of schools. On the single-lane highway just outside of town, the limit is 60 and 70 km/hr. Legally being able to drive 100km/hr in Toronto is now a vague memory, almost from another lifetime. Car ownership and driving in Yellowknife are definitely different from down south. 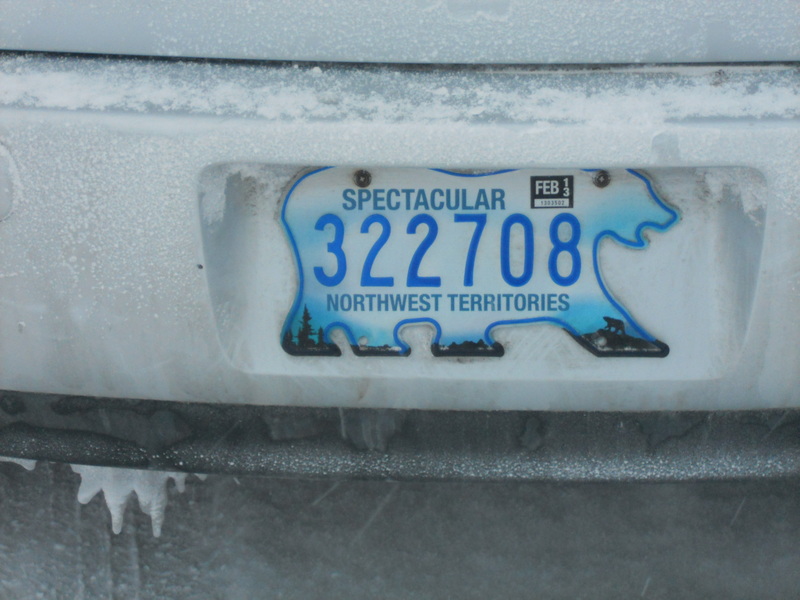 For one thing, our licence plates are unique, shaped like polar bears. When it comes to driving conditions, the road surface varies, as snow ploughing is infrequent. Due to the dryness of the climate, the snow here falls in dry, light, feathery flakes, but it hardens like concrete. So it requires scraping up, rather than ploughing. Salt has no effect at frigid temperatures, so gravel is spread to provide traction. This gravel is the cause of many a cracked windshield, and clouds of dust in the spring, but at least we don’t have to worry about rusted car under-bodies. However, when it’s very icy, I don’t know if any amount of gravel would make a difference, as there have been times when I have barely been able to slide to a stop. 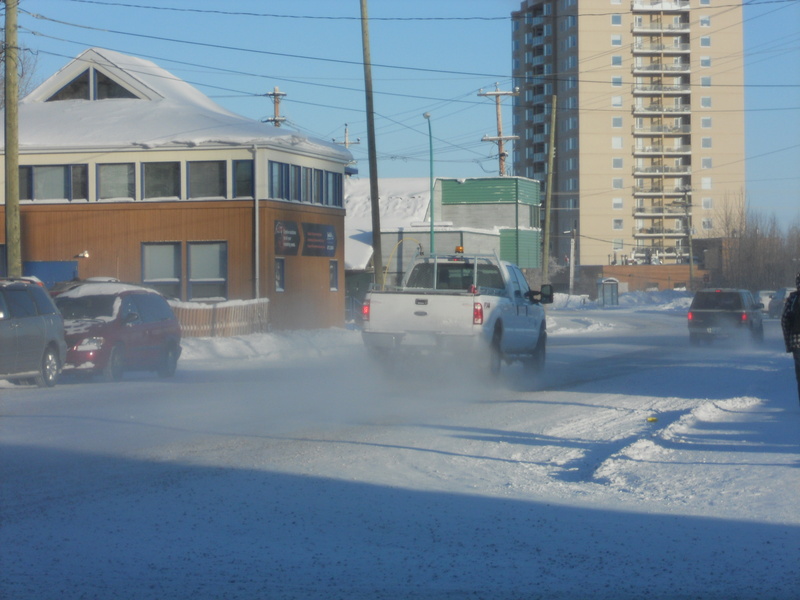 To make matters worse, pedestrians in Yellowknife sometimes decide to cross the street when the light is not in their favour, and will often step out into the road at pedestrian crossings and stop signs without looking, and continue merrily on their way. They seem to fully expect that motorists can see them in the dark in the first place, or that cars that can stop on a dime in summertime can always do so in winter as well. When I’m on foot around town, I make no such assumptions. I’m well aware that when the road is covered in its winter cement, it’s impossible for drivers to see the markings for pedestrian crossings, and when it’s dark, it can also be hard to see the signs. If I were in Toronto, I would have squeezed one more season out of my winter tyres. But when faced with the carefree pedestrians of Yellowknife, I decided that I didn’t want to be responsible for reducing their numbers, so I replaced my tyres with brand new ones, with studs. After a heavy snowfall, the cars eventually make tracks in the road, which soon develops bumps and ruts. The less-travelled streets are an expanse of white, where it’s easy to park partially on the sidewalk, because it’s indistinguishable from the roadway. Motorists simply have to take their best guess at where the edge of the road is, and some are better estimators than others. When the city plough eventually comes along and clears the street, this creates a huge drop from driveways onto the street. During my first winter, I cracked 2 of my frozen mud-guards on such a descent and the other 2 will probably meet a similar fate this winter, if my street does get cleared. The clearing of snow is done after midnight and the snow is piled up in the middle of the street, leaving gaps at intersections. So the next morning, drivers are faced with mounds of snow piled higher than an average car, which can obstruct the view at intersections. Yet as miraculously as these mounds appear overnight, they disappear before lunchtime. 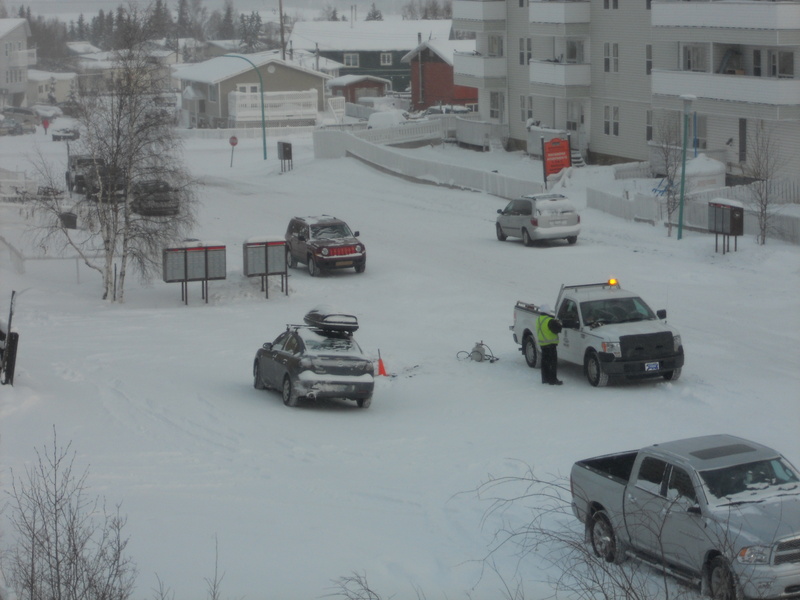 Yellowknife motorists are rarely in a hurry, and are generally very courteous. They will often cede the right of way and if I hear a horn being sounded, it’s a greeting, not a protest. What confounds me is that drivers will sit and wait behind a car that’s turning left at a traffic light, until the light changes. That would elicit a cacophony of honks of protest in Toronto. Even though I’m not in a hurry, I think it’s plain silly to sit there, so I’m the one driving the car that goes around the left-turners. My favourite place to go for a drive is on the ice road between Yellowknife and Dettah. Despite having done it countless times, it always feels somewhat adventurous. 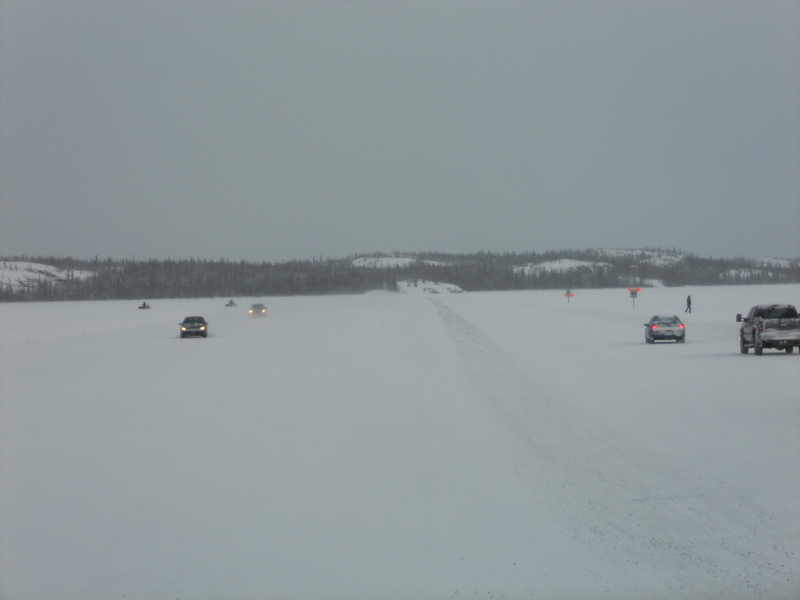 This road is carved on the frozen surface of the Great Slave Lake and it opens in late December or early January, when the ice is thick enough and the temperature is consistently cold enough to maintain it. It’s a marvel that a few feet of ice are all that separate me from water so frigid that I’m positive that I wouldn’t survive more than 10 seconds in it. Equally astonishing is that the ice is strong enough to support a small car or a heavy truck, and you can hear it cracking as it flexes. There are people who go cross-country skiing, snowshoeing, walking their dogs and snowmobiling on the lake as well, so motorists have to look out for people, dogs and snowmobiles crossing the road. The road is built very wide, (by my estimate at least 3 lanes in either direction with a generous median) and the speed limit on it is 40km/hr. The fine for speeding is high, up to $860. The reason for this excessive penalty is that speeding vehicles create bigger waves in the water under the ice, which can damage the road, and repairs are costly, sometimes requiring road closure. 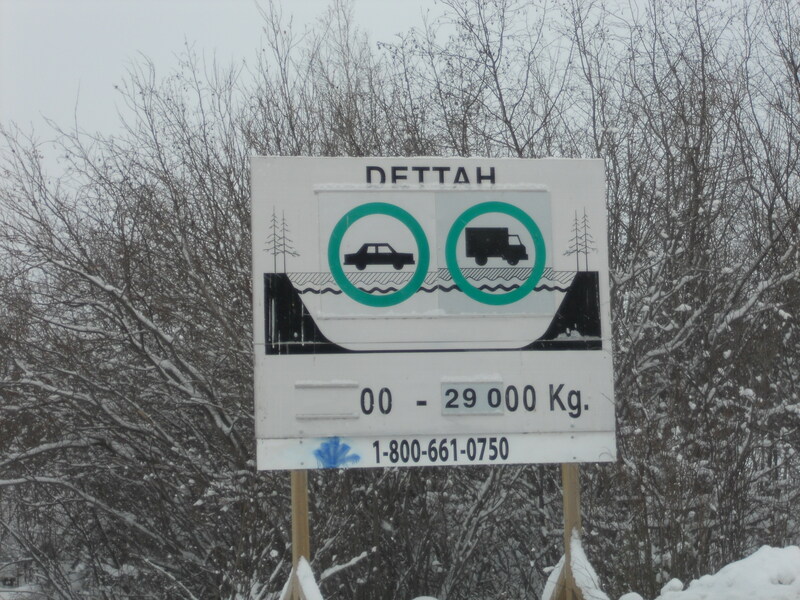 When you consider that some northern communities are accessible by land only in winter thanks to ice roads, and that the diamond mines also use them for seasonal transportation, one speeding motorist can disrupt life for a lot of people. Winter north of the 60th parallel is hard on the human body, but it’s absolutely brutal on cars, which have to sit outside and freeze all day long. I was advised to instal an engine block heater before I left Toronto, because mechanics are very expensive in Yellowknife. So I had the block heater installed, drove my car some 5,000+km out here without a glitch, and felt confident that I was ready for winter. Never in my life have I ever been so mistaken about anything. I’m into my second winter now, and granted, my car is getting on in years, but it never gave any trouble in Toronto. 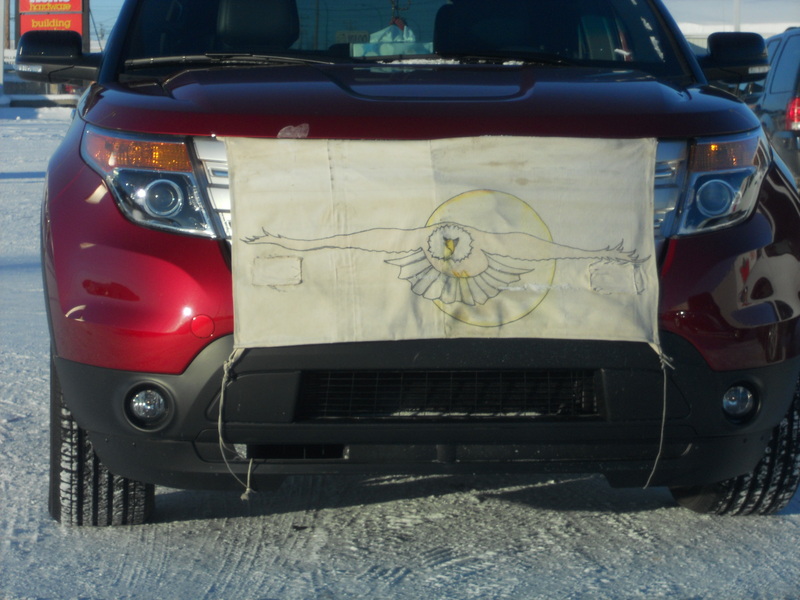 It’s been to the mechanic in Yellowknife more than it’s ever been in its entire life before. Early during the first winter, which I was told was milder than usual, one morning the temperature dropped to -20°C and the car wouldn’t start. By that I mean that the engine wouldn’t even turn over, that I was greeted by the sound of silence. I was perplexed, because the coldest temperature that I’d experienced in Toronto was probably -29, and the car had started with no trouble, and it wasn’t plugged in. Thankfully, I had a subscription to CAA, (which I never made use of in Toronto) so the rescue truck arrived and after some time, the very chatty driver managed to get the car going. He also referred me to a mechanic. That was when the mechanical guessing game began. First it was that the battery – less than 2 years old – had probably discharged in the cold, so it was replaced by one with more cold cranking amps. One of my colleagues at work suggested that I instal a battery blanket to keep it warm, so off I went to give Canadian Tire my money. Nothing changed, so back to the mechanic. Next it was probably that the clutch switch was freezing, so that was replaced too. That made no difference either. When I left my car to be repaired while I was out of town, and returned to find that the mechanic had left town for a few weeks and my car was untouched, I found a new mechanic. New mechanic, new diagnosis: a faulty module in the computer. A quick-fix circuit was built to bypass that. By then it was March, and no longer cold enough to test whether the problem had been rectified. But I understood why some people park their cars up for the winter and walk. During the spring, summer and fall, my car was its usual faithful self. Then this winter appeared and temperatures below -19°C arrived much earlier than the year before. Lo and behold, my previously faithful buggy wouldn’t start. Back to the mechanic, who declared that the entire computer was malfunctioning in the cold and needed to be replaced. There are no Volkswagen dealerships in Yellowknife, hence no chance of having it replaced in town. So I was faced with a choice: either drive about 17 hours on wintry roads to the nearest dealership in Edmonton (and hand over $2,500), or settle for a $300 bypass of the computer, with a button installed on the dashboard wired to the engine, which was guaranteed to start the car, no matter what. I felt as if I were back home in Trinidad & Tobago, where, just as in Yellowknife, people solve problems rather creatively. Needless to say, I chose the bypass, which I fondly refer to as my “Easy Button”. In addition, in my quest to eliminate even the most remote probability of anything freezing, malfunctioning, discharging or thinking of misbehaving in the cold, I added some gadgets. I now drive a car that has had a double-bypass, and which is fitted with an engine block heater, a battery blanket, not one, but two oil pan heaters, plus a trickle charger for the battery, all connected to 2 extension cords inside the engine. I also have a cover for the windshield, so I don’t waste time scraping off frost in the mornings. When I plug my car in, it probably uses 3 times more power than anybody else’s car. However, whenever I turn the key on a frigid morning and I hear nothing, I simply press my Easy Button, and I know with certainty that either my car is going to start…or it is going to explode. Thus far, it has always started. Plugged in and all dressed up, not going anywhere. Mind you, getting it started is only the beginning of the journey. 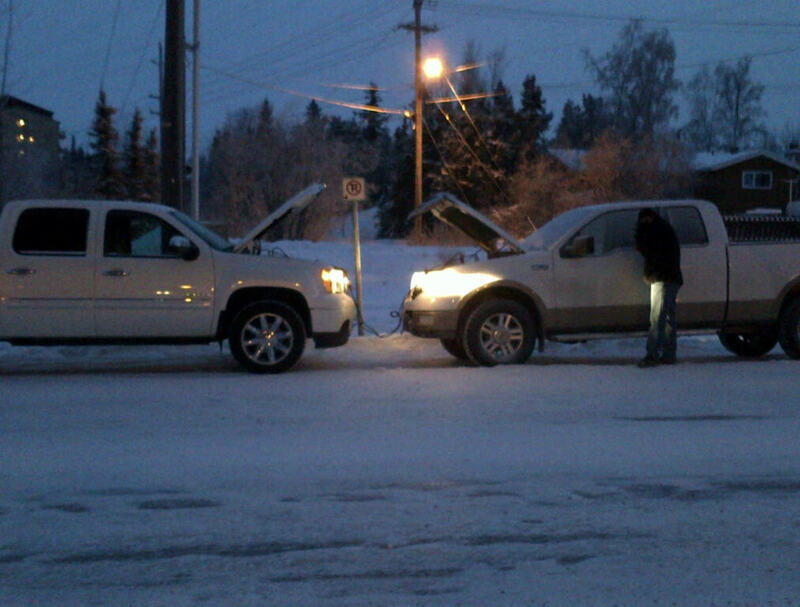 Driving in Yellowknife winters is a 4-step process. Keeping my multiple gadgets intact is step 2. I have learned the hard way to unplug the car before I start it, because one morning I was running late and I drove off while it was still plugged in, and broke the plug on my extension cord. I realized what had happened only when I heard the sound of it ricocheting against the post. Previously, I would see the occasional extension cord lying astray in a car park and find it rather odd. Now I know, only too well, exactly how it got there. This is why my gadgets are plugged into an extension cord inside the car, which is plugged into another one at the electrical outlet. It’s easier (and cheaper) to replace extension cords than the cords on the various gadgets. Step 3 is interpreting, then knowing when to ignore, various warnings and noises. When it is very cold, as in colder than -30°C, my car makes all manner of sounds that it doesn’t ordinarily make, and behaves rather strangely. First of all, when it starts, it sounds like a helicopter. 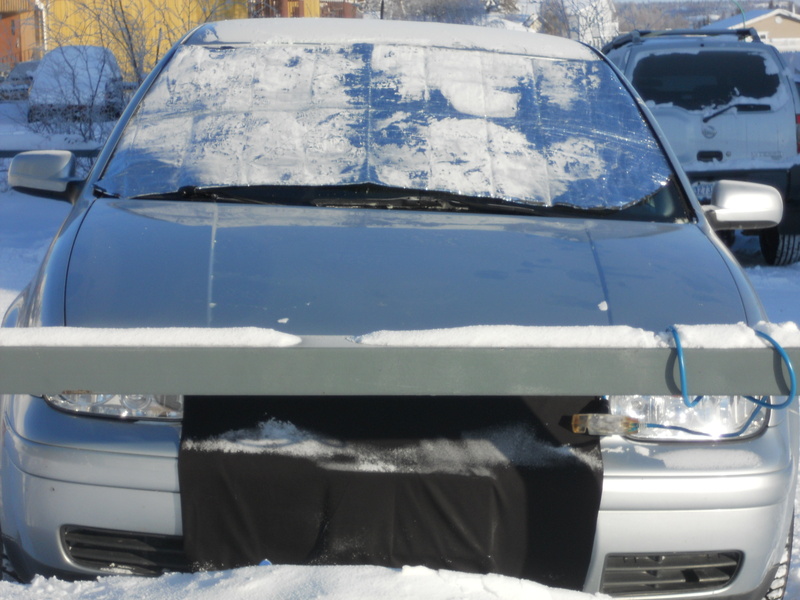 If I have to get something in the trunk, I have to hold the hatch-door up, because the hinge doesn’t hold in extreme cold. I learned this after having the door come down heavily on my head one day. When it’s colder than -35°C, it’s guaranteed that all kinds of lights will illuminate on the dashboard. On many a frigid morning, I have pulled out the frozen manual to figure out what some of those lights indicate, because I’ve never seen them before. For too many of them for my comfort, the instruction is to drive very slowly and take it to the nearest dealership right away. Had I been in Toronto, the land of multiple dealerships and problem-free car ownership, I might have fallen for that. But in winter up here, dashboard lights simply cannot be taken too seriously. Actual driving finally takes place at step 4. When the car starts moving, it moans and groans in protest, it creaks and squeaks, things rattle and it sounds heavy, like the Batmobile. If flights at Yellowknife airport can be cancelled because it’s “too cold to fly”, there really should be times when it’s deemed too cold to drive. Another one of my kind colleagues at work fitted my car with an engine grille cover, while he was in the process of making one for his vehicle. It’s supposed to keep the cold air out of the engine to prevent it from freezing, or to keep the heat in, depending on how you look at it. I’ve seen them on many vehicles around town. They range from simple pieces of cardboard cut to fit, (some neatly, some not) to custom covers, to canvas of various colours, and some are decorated by hand, with drawings and even embroidery. I got the plain-cut black canvas version, which suits me just fine. During my first winter here, I was horrified that people would leave their vehicles idling for ages – mostly unoccupied, but sometimes with children or dog inside. Walking through any car park was a test of how long I could hold my breath, because there was so much carbon monoxide from idling vehicles. It was worse than the smog in Toronto. Sadly, I have now become one of “those people”. On very cold days, I start my Batmobile 10 minutes before I’m ready to leave home, and I let it run. Likewise in the evening before I leave work. I no longer care which dashboard lights are screaming at me, because I know that they will go off once the engine has warmed up. En route, if I have to pick up one or two items at the supermarket or a store, I leave the car running. I figure that the extra cost of gas is nothing compared with the damage I’m wreaking by starting the engine in extreme cold, driving for 3 minutes, turning it off, starting it again 5 minutes later and repeating that with every errand. In the summer I fill up the tank once a month, and last winter I filled it twice a month, as soon as it got to half-full. This winter it gets there much faster with all the idling, but it’s been so cold that now, unless the gas level is really low, my fill-ups are done only on days when the temperature zooms up to the low -20s. That’s the limit of what my uncovered fingers can tolerate, even for the 5 seconds that it takes to unscrew the cap on the gas tank. There are aspects of driving here that required some adaptation. Ice fog is a phenomenon that I had not experienced before. It occurs when the temperature drops very low and ice crystals become suspended in the air. It’s very thick and at those temperatures the exhaust from cars is already very white. So I have learned to drive through air that is like cotton candy, practically as white as snow, and to deduce that even though I can’t see it, there must be a vehicle ahead of me because there’s white air blowing back at me. My sense of personal safety has changed since I’ve lived in Yellowknife. In Toronto, if my car had shut down on the highway, there is no way I would not have got into a car with a stranger, night or day. Perhaps I used to watch too much Criminal Minds back then. But in Yellowknife, I would do it. People here understand that cars give trouble in this climate, so they will stop for stranded motorists. Every time my car has been at the mechanic, someone has offered me a ride to and from work, or to the grocery store, or anywhere I want to go. People have also offered me the use of their cars. Yellowknife is a small town, so if my car were to shut down in town, I’d just leave it and take a taxi or walk home, and wait for CAA. But if I were stranded on the highway outside of town on a frigid winter night, even if I had cell phone coverage to call CAA, the wait might be long. So I would accept a ride from a stranger, and no alarms would necessarily be going off in my head. Well, perhaps they would emit a high-pitch scream if it were 4 men in a pick-up truck who stopped, who’d been drinking and who called me “darlin'”. But if I were faced with the choice of either freezing to death for sure, or keeping my blood circulating and taking my chances, I think that I might take my chances. I already do that in winter every time I start my car.